The east side of Zion National Park has some great hiking that is off the beaten path such as this short little drainage located near the smaller tunnel in the park. Although most visitors drive through the east side and are in awe of the beauty. They are at a loss for what do beside the classic Canyon Overlook Trail and of course most stop at the many pullouts along the Zion-Mt. Carmel Highway. In realty, even though established east-side routes are not shown on your park map, there are a multitude of places to explore amid Zion's slickrock. Best Season: Year-round. Hiking in slot canyons presents a very real danger from flash flooding. Do not hike this trail if it is raining. Remember a storm far off can trigger a flash flood. Parking - Just east of the small tunnel .25 miles is a pullout on the north side of the road just after a left hand curve. There is enough space for several vehicles, but may be occupied during the busier spring and summer months. 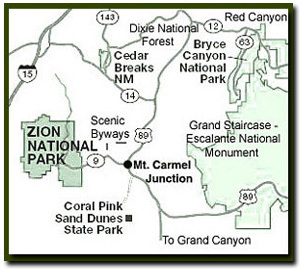 The little tunnel is 1.5 miles east of the 1.1 mile long Zion-Mt. Carmel Tunnel. Tunnel Canyon - This canyon involves an easy one mile round-trip hike through a mostly slickrock waterway. From the parking area, walk back toward the tunnel and look for the wash that enters from the north, just at the entrance of the tunnel. Find the beaten path down into the wash. Ascend the slickrock wash where you will find relatively easy hiking as it ascends for the next half-mile until reaching the saddle where you can no longer continue. Never scramble up or down slickrock without the proper skills and without sticky shoes appropriate for hiking on slickrock. Serenity, solitude and a total feeling of the backcountry experience is found as you work your way up this pretty wash.
Equipment: Sticky rubber soled hiking shoes. Difficulty: Some slickrock scrambling may be required. Trailhead: The small tunnel along the Zion-Mt. Camel Hwy. Trailend: Same as the trailhead. Trail Access: The Zion-Mt. Carmel Hwy is open year-round. Tunnel Canyon is a nice excursion off the beaten path, and in the east side of the park.